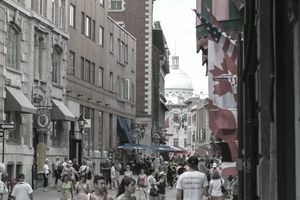 Canada's retail sector continues to maintain a presence, albeit diminished, on the global stage in terms of retail chains that generate the most revenue. Only six of the largest Canadian retailers appear as of 2018 on the annual Global Powers of Retailing list published by Deloitte Touche Tohmatsu. The latest available rankings use publicly available data for fiscal years ended through June 2017. The number of Canadian retailers on the list has been cut in half since 2011 as the industry continues to see consolidation and other changes driven by new dynamics in retail. Canada's retail trade landscape, like other countries, has shifted dramatically due to the continued rise of e-commerce and other industry factors that shook up the Global Powers rankings. Year over year, changes in the 2018 rankings for Canadian companies included hypermarket-supermarket Loblaw slipping one place down to 30th in 2018. Department store owner Hudson's Bay leaped to 87th place, up from 114th place in 2017, even though it reported substantial net losses. Metro fell three places to 101st, Canadian Tire moved up one spot to 111th, and supermarket chain Overwaitea Food fell six places to 249th. Empire held steady at 53rd place in 2017 and again in 2018. Moreover, some of Canada's largest and fastest-growing retailers were absorbed by foreign rivals, which led to their removal from the list. Home improvement company RONA, for example, was acquired in 2016 by U.S.-based Lowe's Corp. RONA had previously made acquisitions of its own that led to its rapid rise in the Global Powers rankings, jumping 47 positions between 2012 and 2013. As often happens in retail, larger rival Lowe's acquired RONA to complement its operations and to halt potential competition. The RONA brand still exists but as a subsidiary to its new parent. Katz Group, one of Canada's largest privately-held companies, previously made the Global Powers retail list. The sale in 2016 of the company's drug store business to McKesson Corp. led to its exit from the rankings. Katz Group still maintains other operations in sports and entertainment but not in retail. The shakeout and shift in positions for some of the remaining Canadian businesses show that there is some turmoil in this market as companies look for ways to rekindle prior growth. Notable activity by Canadian retailers includes an acquisition in 2016 by Hudson’s Bay that gave it control of online lifestyle and flash sale retailer Gilt Groupe Holdings. The company's intent at the time was to leverage Gilt to work with the Saks Fifth Avenue branch of Hudson's Bay. The deal would be short-lived. Hudson's Bay announced in 2018 it would sell Gilt Groupe to rival flash sales site Rue La La. Hudson's Bay also announced in 2018 plans to close 10 stores, including its flagship location on Fifth Avenue in New York City. Though Hudson's Bay was fighting to adapt to the changing dynamics of retail, the company had seen growth in its recent history. The company ranked eighth among the list's 50 fastest-growing retailers for fiscal years 2011 through 2016. The list below of the largest Canadian retail chains ranked on the 2018 Global Powers of Retailing shows how the landscape continues to evolve as consumers and retailers adopt new approaches to shipping. The number next to each company name represents the revenue ranking of the retail company compared to the other "world's largest" retailers on the Global Powers list. 111 Canadian Tire Corp. Ltd.
Who Are the World's Largest Retailers in 2014?